The purpose of financial assistance is to provide funds to students that otherwise would be unable to pursue a college education. This assistance is intended to supplement (not replace) the amount the student and/or her or his family can afford. Officially apply for financial assistance by completing the Free Application for Federal Student Aid (FAFSA) by the July 1 state deadline. For questions, please contact the Allen College Student Financial Services Office at FinancialAid@allencollege.edu or (319) 226-2514. Financial assistance is available to Allen College students through a variety of sources: need-based financial programs, non-need based financial programs and scholarships. In response to the Federal Trade Commission’s recent ruling, steps have been taken to ensure the protection of individual’s private information as related to employment and education. Allen College is required by federal regulations to collect and use social security numbers as identifiers. The use of social security numbers as identifiers is limited to those situations and to those agencies requiring this information in relation to the awarding of student financial aid, loans, and/or licensure. Federal Pell Grant funds are for undergraduate students who are pursuing their first Bachelor's degree. This is a federal grant and is based on financial need and the maximum Pell Grant award is $6,195. The awarded amount is based on full-time enrollment (12 or more semester hours) if actual enrollment is unknown. The actual amount of your Pell Grant will be adjusted based on your current enrollment (Full time = 12 or more hours; 3/4 time = 9-11 hours; 1/2 time = 6-8 hours; less than 1/2 time = 1-5 hours.) Your Pell Grant amount will be adjusted throughout the first three weeks of the semester should your enrolled hours change. You are limited to 12 full time semesters of Federal Pell Grant. Federal Supplemental Educational Opportunity Grant funds are for undergraduate students who are pursuing their first Bachelor's degree. This is a federal grant and is based on financial need. The awarded amount is based on full-time enrollment (12 or more semester hours) if actual enrollment is unknown. The Iowa Tuition Grant is for undergraduate Iowa residents who attend private institutions of higher education. The award amount is based on full-time enrollment if actual enrollment is unknown. Part-time students who are eligible for Iowa Tuition Grants are awarded based on actual course hours taken only at Allen College and/or other qualifying private institutions. Grant amounts are subject to change as a student's enrollment changes. You are limited to 8 full time semesters of Iowa Tuition Grant. In the event that available state funds are insufficient to pay the full amount of each approved grant, the Iowa College Student Aid Commission has the authority to administratively reduce the award. A Federal Subsidized Direct Loan is based on financial need and the government pays the interest while a student is attending school at least half time. A Federal Unsubsidized Direct Loan is not based on financial need and the student is responsible for all interest costs. The student has the option of paying or deferring the interest while they are in school at least half time. If you accept a Subsidized and/or Unsubsidized Direct loan, you must complete an electronic promissory note at https://studentloans.gov/myDirectLoan/launchMpn.action?mpnType=subUnsubMpn and entrance counseling at https://studentloans.gov/myDirectLoan/counselingInstructions.action?counselingType=entrance. Interest and deferment information is available at https://studentaid.ed.gov. The 2015 3-year cohort default rate for Allen College is 1.6%. The national average cohort default rate is 10.8%. A Federal PLUS Loan is a loan that graduate or professional degree students or parents of dependent undergraduate students can use to help pay educational expenses. It is not based on financial need and the borrower is responsible for all interest costs. Repayment can be deferred until the student completes school or it may begin within 60 days after the loan is fully disbursed. If a PLUS Loan is accepted, it must be applied for on a separate application. Go to www.studentloans.gov to complete a PLUS application and promissory note and obtain interest and repayment information. The Federal Work-Study Program is a need based financial aid program. Work-Study provides funds for students to work part time on campus while they are enrolled in at least six credit hours. 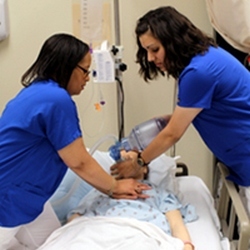 Allen College students work an average of 10-15 hours per week. Contact the Student Financial Services Office for job placement opportunities. A Federal Nursing Student Loan is based on financial need and is interest free while a student is attending school at least half time. If a Federal NSL is listed as part of your financial aid award, you must apply for it on a separate application. If you accept a NSL, the application/promissory note will be mailed to you upon return of your award letter. This loan will need to be repaid beginning 9 months after you graduate or leave school. Interest is 5%. An alternative student loan is not based on financial need and is based on credit worthiness and ability to repay. They are borrowed by the student, but many require a credit worthy co-signer. Many offer deferment of principal payments while the student is enrolled. See a historical list of alternative student loan providers to review and compare terms and conditions prior to borrowing at this link: https://choice.fastproducts.org/FastChoice/home/3069100/1. The table below shows the maximum COMBINED amount you may borrow in the Federal Direct Subsidized and Unsubsidized Loan Program. All students are eligible to apply for scholarship assistance. Allen College Winter Family Promises to Keep Award: Undergraduate students are eligible to apply for this award for financial assistance in their final two semesters of study at Allen College. Allen College is restricted from awarding to UnityPoint Health – Waterloo (Allen Health System) employees. The "Winter Family Promises to Keep Award" seeks to create a partnership between the student and Allen College. The goal of the award is to provide financial support for deserving Allen College undergraduate students while also creating a vision of philanthropy through this relationship that will benefit future generations of Allen College students. The name of the award signifies the commitment by the recipient to provide philanthropic support for future Allen College students. In response to the Federal Trade Commission’s recent ruling, steps have been taken to ensure the protection of individual’s private information as related to employment and education. Allen College is required by federal regulations to collect and use social security numbers as identifiers. The use of social security numbers as identifiers is limited to those situations and to those agencies requiring this information in relation to the awarding of student financial aid, loans and/or licensure. All of the members of Allen College’s Financial Aid team receive annual external training to ensure expertise in all state and national regulations related to providing financial aid counseling and disbursements to our students. Documentation of training may be provided upon request by contacting Allen College’s Executive Director of Business and Finance at (319) 226-2012.